January marks the start of countless celebration of devotion and pageantry in the Philippines. For this month alone, three major festivities will be held in three different provinces to honour the Child Jesus or the Sto. Niño. Cebu and Kalibo in Aklan will stage Sinulog and Ati-Atihan respectively on the third weekend of January, while Iloilo will celebrate Dinagyang on the last weekend of the month. 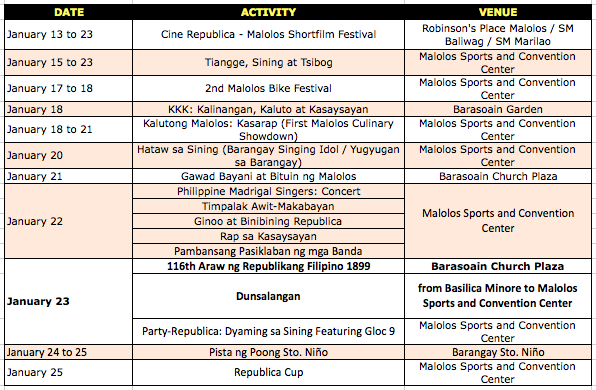 If you we're not able to book you flight ticket to join the festivals in the Visayas region, there is one province that will give you four different reasons to visit, experience and enjoy their activities and events offering for this month. Bulacan is just an hour away from Manila via the North Luzon Expressway (NLEX) or the McArthur highway, it is the first province north of Metro Manila. This January, four festivals will be happening to celebrate religion and devotion (Sto. Niño de Malolos Fiesta), food product (Minasa Festival of Bustos), livelihood (Halamanan Festival of Guiguinto) and history (Fiesta Republica of Malolos). 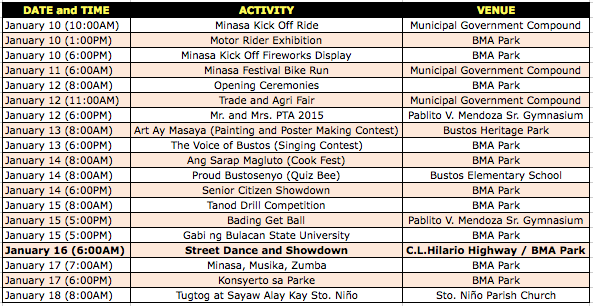 This article will provide you the complete list of activities for each festival to serve as your guide and reference to fully enjoy the Bulacan experience. Minasa cookies is an original food delicacy of Bustos Bulacan made from cassava flour, egg yolk, coconut milk and margarine. The name Minasa came from the actual hand mixing of the ingredients to create the cookies. After mixing, they will put it in a wooden mold and bake it in the oven. The Minasa Festival will showcase this locally made food product in their week long celebration. Guiguinto, the Garden Capital of the Philippines celebrate Halamanan festival coinciding with the municipal founding anniversary and the feast day of their patron saint, San Ildefonso every January 23. It is an exhibition of their famous landscaping and gardening services. The highlight of the 3-day event is their colourful street dancing competition. Malolos City, the capital of the historical province of Bulacan celebrates the Fiesta Republica as part of the anniversary of the Malolos Congress, the First Philippine Republic, the first in Asia. One of the highlights of the week-long celebration is the street dance drama competition Dunsalangan (Dula sa Sanlangan) showcasing the role of Malolos and other provinces in different historical events in pursuit of Philippine independence. Happening every last Sunday of January is the feast day of the Sto. Niño de Malolos, the patron saint of the Kamestisuhan street. It is said to be the most celebrated Sto. Niño procession in Luzon with the participation of almost two hundred different images of Sto. Niño from different places in the Philippines. You may click this link for the Sto. Niño de Malolos 2014 Fiesta gallery. The meaning of this is that you actually get rid of fat by consuming Coconut Fat (also coconut milk, coconut cream and coconut oil). These 3 researches from major medical magazines are sure to turn the conventional nutrition world around! Hello I'm JOEL. Join me in my travel and food adventures. Let us explore and discover the beauty and wonders of nature together.